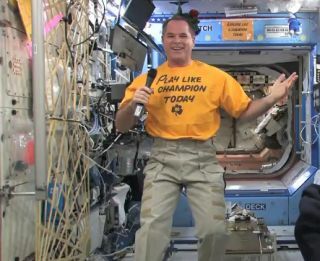 NASA astronaut Kevin Ford smiles while wearing his Notre Dame "Play Like a Champion Today" shirt on Dec. 26 to support the college's BCS Championship Game against Alabama on Jan. 7, 2013. Ford is the commander of Expedition 34 aboard the International Space Station. When it comes to college football, NASA astronaut Kevin Ford is Irish through and through. Ford will be rooting for Notre Dame all the way from space during the BCS Championship game against Alabama tonight (Jan. 7). Ford is currently living on the International Space Station, where he commands a six-man team, but tonight his heart will be with Notre Dame —his alma mater —when the team faces off with Alabama's Crimson Tide in Miami. "The team's played great," Ford said in a recent interview with Notre Dame officials on NASA TV. "Obviously the defense is very special, and the offense is just really clicking. I'm looking forward to a great game on the seventh of January." Ford has been living on the space station since October, when he blasted off aboard a Russian Soyuz rocket. He took charge of the space station's Expedition 34 crew a month later and will return to Earth in March. He is a native of Montpelier, Ind., and is a retired colonel in the U.S. Air Force. For tonight's championship game, though, Ford said he asked Mission Control for some post-game recovery time. That way, he can watch most of the game live during the overnight hours. "It's normally used for science data, but on weekends, if it's free, they'll let us get a little bit of TV," Ford added. "I've been able to follow the team and see a lot of the games." The astronaut even has his favorite Notre Dame garb on the space station to support the team. During his interview, he pulled off his Expedition 34 sweatshirt to reveal a "Play Like a Champion Today" t-shirt just for the team. He also has a sign that reads "Explore Like a Champion Today" mounted over one of the space station's hatches, much like the iconic sign Notre Dame players touch on the way to the field at their home stadium. But before Ford ever signed up for NASA's astronaut corps, he was a student at Notre Dame. He studied aerospace engineering and graduated with a bachelors of science degree in 1982. He even learned Russian along the way, something that happened to come in useful recently. "I took a Russian class at Notre Dame," Ford said. "Never in my wildest dreams did I think I would fly someday in a Russian spacecraft with two cosmonauts, speaking only Russian." While Ford is a die-hard Notre Dame fan, he did have some fun with flight controllers at the NASA's space station Payload Operations Center at the Marshall Space Flight Center in Huntsville, Ala. He played the University of Alabama's fight song in the "spirit of good sportsmanship" on Sunday, agency officials said.